“Ranger was reported to us as lost in Westbrook on September 20,2017. On September 28,2017, we were advised of the good news. “I wanted to let you know that I found him!!! Thanks for your advice!!! Stephanie"
In December, we placed this add: for this kitty: "My female tabby cat PENNY has been missing since 12/15/2015 from … Manchester. Whitney". On January 3, 2016, we received the following message of joy:﻿ "Cannot thank you enough for caring and sending helpful information. I wanted to let you know that my sister's cat did return before the new year! She was fine and is now securely at home. Thank you! 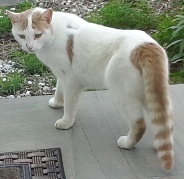 Sarah﻿"
We posted this ad: "Cat lost on Deer Run Road, WILTON. A long haired tabby.Neutered male. Went missing on Sunday late afternoon (11/08/15). Very friendly. On 11/19/2015. We received this great news: “Thanks so much for your help. Just a quick note to let you know that our cat arrived home after 5 days. Very skinny and hungry but otherwise fine! Rebecca﻿"
In October of 2015, we posted this ad for the calico cat: “Female cat named Luna lost in WETHERSFIELD,near Mill Woods park on 10/7/2015.,,,"On October 16,2015, we received the ﻿ollowing happy news: "Happy to report that after 8 days Luna returned last night, my daughter had just come home, can't be happier. A note of thanks for your support, knowing you and your DEPT are there is comforting.﻿"
This cat was found and an ad was placed on our website to find rightful owner on September 10,2014. "T﻿h is﻿﻿ cat start.﻿ed showing up in early June on South Street in New Britain. Was extremely skinny so it may have been lost longer. Very ﻿friendly and gentle...Priscilla" We then received an email on Sept. 23, 2014 as follows: "just wanted to get back to you to let you know that the picture that you posted on your website for me of a found grey cat near South Street in New Britain will be reunited with her owner shortly. You were correct in your guess that she is a pedigree cat, we found out that she is a Persian and her name is Sofia. She is an indoor cat that had gotten out accidentally after coming back from the groomers many months ago.﻿ I wanted to particularly thank you for the advice to post pictures in the neighborhood. We followed your advice and posted about a dozen pictures in the surrounding half mile radius around my house and I just got off of the phone with a very happy owner because she saw one of our posters. 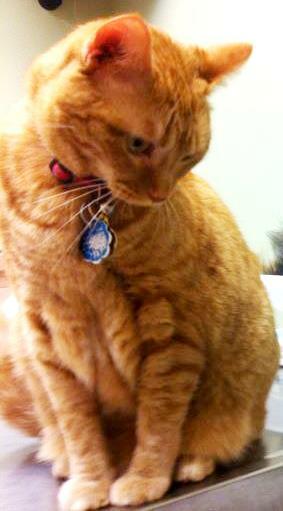 I just wanted to say "Good Job and I thank you for your help and advice.﻿ Sincerely,﻿ Priscilla﻿"
This cat named Bella was lost on September 12,2014 in Oakville and an ad was placed on our website. On September 21, 2014, we received this wonderful email: "﻿After ten days our cat Bella came home'very hungry but ok. Thank you for getting the word out.﻿ Laurie"
﻿On August 4, 2014, we posted this ad for this kitty:”Missing cat from Burnt Plains Rd area Milford,CT.. Very friendly 1 1/2 year old indoor cat.﻿ Her name is scooter but the kids call her kitty. Please call Orissa” . Five days later on August 9,2014, we received the following joyous email: " Thank you so much for your help and support. Our kitty has returned! It was not easy, but after many attempts the have a heart trap worked. She has lost a lot of weight and is exhausted. All she wants t0 do is cuddle and sleep.We are so happy to have !her back! Thanks again. 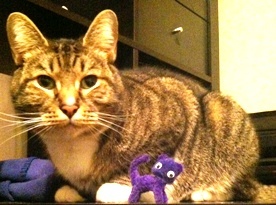 Orissa﻿"
"I cannot thank you enough for the support your website gave me while my cat was missing. Reading your success stories truly helped get me through this tough time. Seeing that some cats resurfaced after missing for weeks gave me hope. Our cat Jake returned home after being gone for 4 weeks! He survived several bad snow storms and cold weather. He finally wandered to a neighbor's door just across the street from our house and meowed until they let him in. They brought him in and contacted us because they had seen a flyer that we handed out door-to-door a few weeks ago. He's a few pounds lighter but healthy and so happy to be home! Thank you so much for posting on your website, but you can move us to your success stories to inspire others. It is possible for them to survive in terrible conditions and, since they're intelligent, they'll make it home even if they have to find a human to help them get there. I cannot stress enough how critical it was to get word out around the neighborhood. 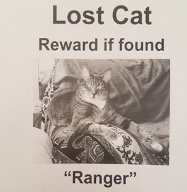 Not just hanging flyers, but ringing doorbells and handing flyers to neighbors directly is what brought our cat home. You were right, he was right across the street the whole time. Thank you thank you so much!! I am so grateful for websites like yours and people like you! 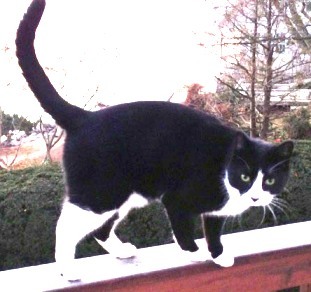 We posted this ad" Male cat named Oreo lost on 2/22/2014 in Derby on Hawkins St. White & black,4 yrs.old & very friendly…" First week of March we received the joyful email: "I wanted to let you know that my cat Oreo was found safe in my neighbors garage on March 2. He loves to walk through an open door and this was the case with him missing. I went over to try to coax him out of hiding and it took a few minutes but he did finally meow and come over to me. thank you for your help in posting the ad to your website! Tracie." On August 18,2017, we posted this ad: “Dearly missed indoor cat named Sweetie green eyed orange female Mainecoon slipped out of the house in Manchester near Rosetto Drive and Union Street. She is a precious member of the family…”﻿ ﻿Three days later on August 21, we received the following great news “I wanted to let you know that my mother's cat Sweetie in Manchester, CT came home safe and sound. Your advice was very helpful in getting her to come back into the house. ﻿Sharon "
Posted on our website was this ad: Female cat named Sophie lost on 6/26/2016 in West Hartofrd…On July 11,2016, we received the following good news:" Thank you so much for your guidance while Sophie was gone! I'm so glad to relay that we successfully trapped her last night in a humane trap. She was gone for 14 incredibly long and stressful days, and we tried to trap her for a week and a half. 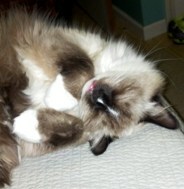 Last night our persistence paid off!﻿ Beth"
Large ragdoll cat named Sophie , long hair, bicolor gray & white was reported missing on the night of May 8th,2015 in DANBURY in the Park Ave. area and an ad was published on our website.. Several days later we received the following good news: "Happy to say Sophie came home tonight at about 9:00 o'clock . There she was crying at my front door, she was a little distraught but seems ok .After three days lost she is happy to be home! Thanks again for everything do.﻿"
Cat named Molly was reported to us lost from Worthington Ridge, near Route 5 in Berlin,CT on April 14,2015. The cat has calico markings . A month later we received the following joyful news: " My brother's cat named Molly, calico and white, missing from Berlin home has returned on its own after an absence of several weeks. In good condition. My brother, who is legally ﻿blind, is thrilled. His next door neighbor found it about a week ago mingling with her three cats.... ﻿Thank you for the service that you make available. I am sure you have many happy reunions recorded. 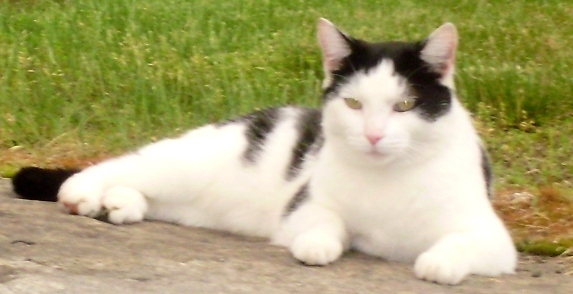 Earl (George's brother in Meriden)﻿"
This cat was lost on 10/7/2014 in Newington and posted on our website. On 10/15/2014 we received the following happy news:﻿ " After eight days our kitty, Moo, did return. We actually got a lot of calls from neighbors today who spotted him. Thank you so much for posting his picture.﻿ Diane." "Gizmo just showed up today! She must have known it was Friday the 13th. Thank you very much for all your help and I am excited to have my kitty home! Kathleen﻿"
Last week of May 2014, we received the following email:"Hi My Elderly Parents have lost there Cat. He is a male, domestic shorthair, medium size, very muscular, Tuxedo. His Name is Rolly. He is about 8 yrs old. He is very healthy. Last seen outside home on Nylked Ter, Norwalk,CT. One June 1, we received the following joyous emal: "Miracle of Miracles. Rolly my parents Cat returned after being gone for 5 days. He was no worse for the wear and the family gave him lots of treats and play time. Thank you for your help. Clare"
In June we placed the following ad for this black cat. “Our cat Parlak missing from New Haven(Nash & Lawrence)since 6/17/2014.All-black neutered male w/yellow-green eyes,short-haired,medium size. Has microchip…” On July 26,2014, we received the following great news: “We have found our cat Parlak, who was lost in New Haven and missing for over a month! Thank you so much for your encouragement, for the information you sent, and for putting our lost pet listings on your database. We think Parlak must have been hiding very close to home, too frightened to come out even when we were going around calling him. Maybe he was accidentally shut inside someone's garage part of the time. Food had been left out regularly for him, and that's where he was found (near the food), very thin but otherwise ok.Thank you again for your helpTerry"